Living greener doesn’t have to mean going off the grid. You can maximize the efficiency of your home and decrease your impact on the environment just by linking your electronics. We provide a variety of solutions that allow you to integrate all of your systems inside and outside of your home into one system that is simple and customized to your unique needs. Lights, shades, door locks, thermostats, entertainment, pool, hot tub, and even the security system can be programmed to your specifications, easily adjusted at the touch of a button, and backed up in the Cloud. 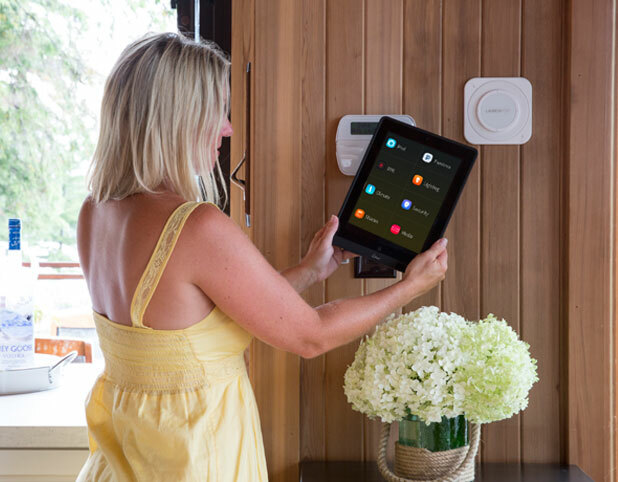 And best of all, your settings can be managed and modified remotely from your smart phone or by iPAD – giving you ultimate control and maximizing the energy efficiency of your properties no matter where you happen to be. Get Green with these energy saving solutions. Dimming a standard halogen or incandescent light bulb by 25% saves 20% lighting energy. Dim more and you’ll save even more. Vacancy sensors and a time clock also help save energy by turning off lights when they are not needed. Controllable window shades can save you 10% on heating and cooling costs by blocking the sun’s rays in summer or letting them in to warm a room during colder months. Temperature control is the perfect complement to light and shade control because it provides the ability to adjust heating and cooling systems any time of day – even while away from your home, saving up to 16% or more of heating and cooling energy usage. Many appliances consume energy 24 hours a day, accounting for a considerable percentage of a typical home’s electricity use. Turning off this standby power as a part of a total home control system saves energy.